This one really made me laugh. 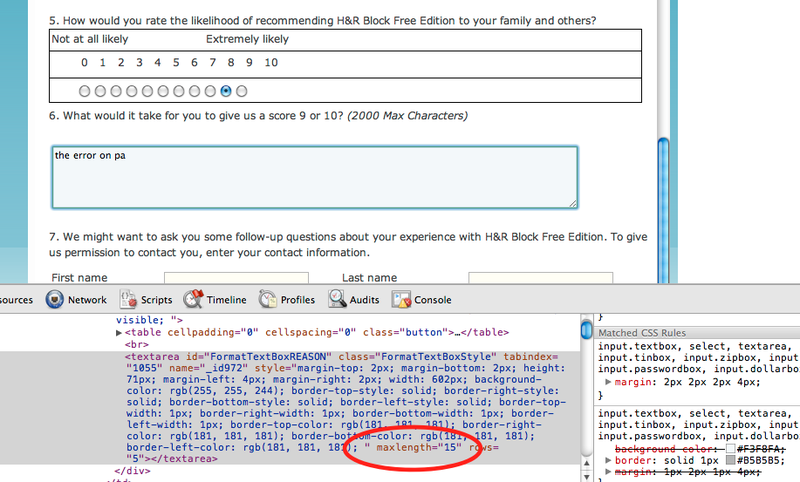 I had just filed my taxes on H&R Block online, and decided to fill out their survey at the end (oh how thoughtful of you... no, I had run into an error during the process that had been thoroughly confusing, and the error offered no help as to what to do or what step to go back to and adjust). In the survey, I finally got to a free form textarea and started typing to tell them how they need to fix their tax errors to actually assist you rather than be cryptic.. when I realized the textarea did not accept any input after the first few words! Turns out, the developers had set a maxlength property on the textarea, of 15. (In the UI it says 2000 max characters... why not set it to 2,000?) I discovered this by inspecting the textarea. 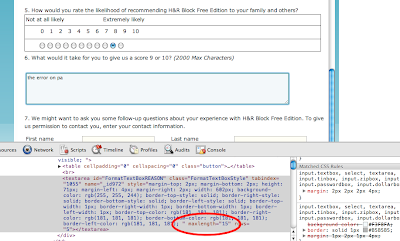 And since I was set on giving my feedback, I then removed that attribute and happily typed as much as I needed. Lesson: As a developer, understand what each attribute does and certainly don't just assume it won't be a problem since "browsers don't support this." Leaving maxlength off, or putting in 2,000 would have been much better options. Also, test across all major browsers...I hear Chrome is getting popular these days. Thank you for your prompt reply! I appreciate knowing that someone is listening. I was able to complete my tax return, and really I think your site is great for e-filing!